Joseph Clover trained initially as a surgeon but, by the 1860s, was one of the foremost anaesthetists in Britain. 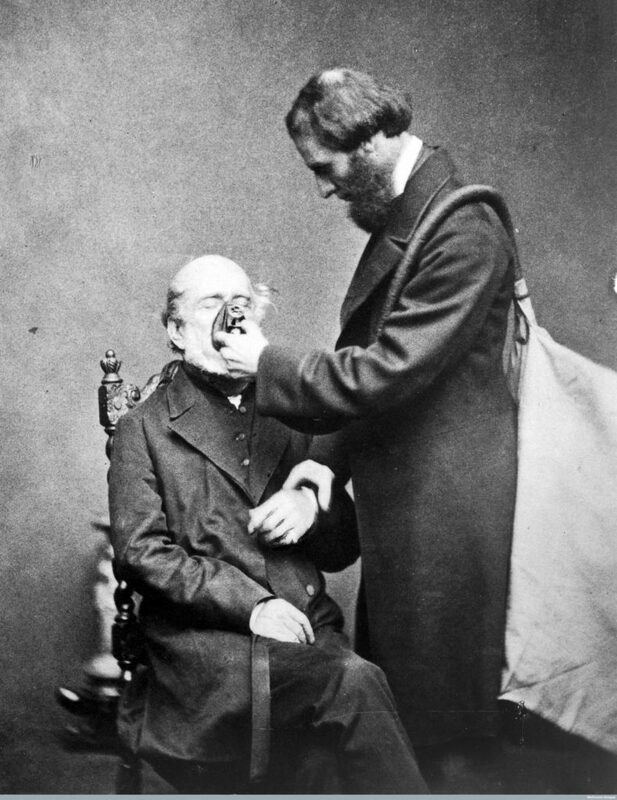 He was one of only a handful of doctors who devoted his practice to anaesthesia at that time. I have been researching his life for many years since the Geoffrey Kaye Museum of Anaesthetic History contains one of his original casebooks. Recently I began to investigate his banking arrangements. Clover was generous with his money, lending it to younger doctors to help them start up in practice – and he was not always repaid for this kindness. Joseph Sampson Gamgee, a famous Birmingham surgeon, was one who borrowed a great deal from Clover and never repaid the debt. But a further query arose while I was investigating his rather scrappy account books. Why were there so many entries about banking in New Zealand? 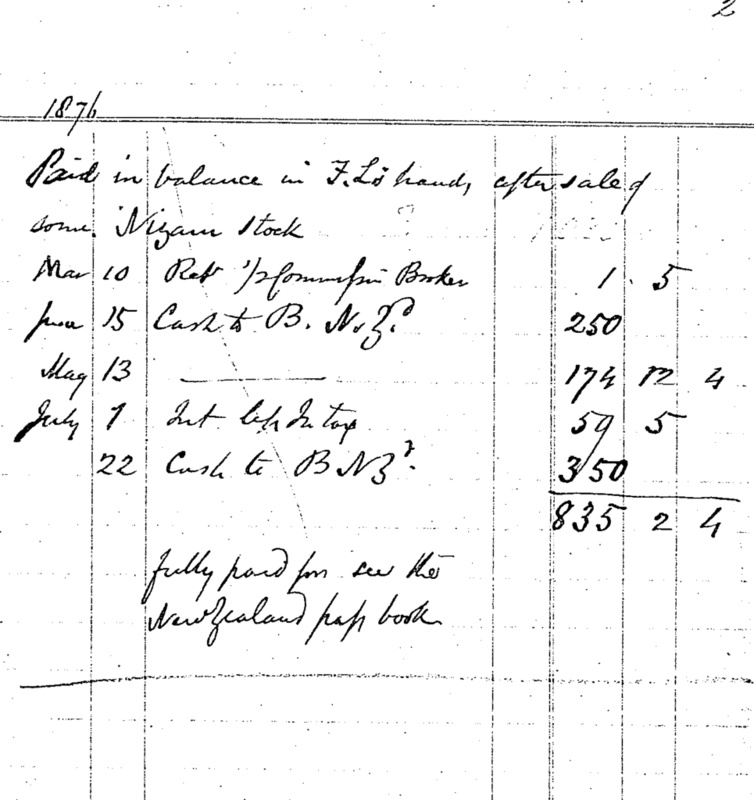 This page from Joseph Clover’s account books shows cash deposits into the Bank of New Zealand in 1876. At the top it says “Paid in balance in FLs hands…” further evidence of Falconer Larksworthy’s role in this aspect of Joseph Clover’s banking. Clover had no connections with Australia or New Zealand that I was aware of but there had to be a reason. Like so many historical research questions, the answer comes when you least expect it. Reading some Clover family records recently I came across some information about Clover’s brother-in-law, which ultimately provided the answer. Clover’s younger sister married Falconer Larkworthy (1833-1928) in 1863. This was not his first marriage. He married Mary Agnes Balston in 1857 but unfortunately she died in childbirth in 1860, giving birth to their son. He met Elizabeth Clover some years before this but became reacquainted with her in 1862 when he returned from Australia. Larkworthy was a banker. 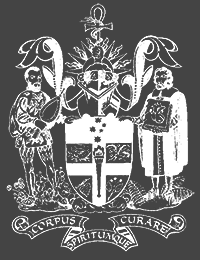 He worked for the Oriental Bank Corporation, who posted him to Mauritius, Cape Town and then eventually, Australia. He had an adventurous time in Australia where he was personally responsible for melting gold dust to make ingots during the gold rush. For a period he rode regularly through the bush, collecting gold dust from the miners and converting their finds into bank notes. He risked bushrangers and random attacks, sleeping with a loaded revolver at his side. His great-grandaughter has written a fascinating account of his life in History Today. 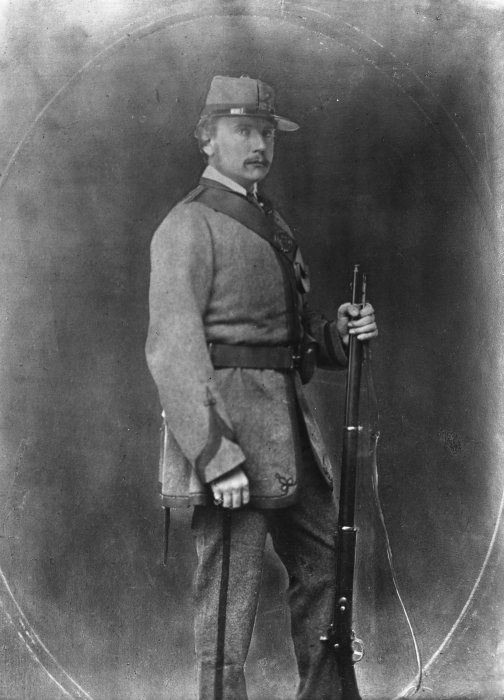 Larkworthy was eventually transferred to New Zealand in 1860. Shortly after that, the Oriental Bank withdrew from New Zealand and the Bank of New Zealand was formed. Larkworthy then agreed to return to England and accepted a position as the manager of the Bank of New Zealand in London. He returned to England in 1862 with his two-year-old son and attended some social gatherings at the Clover’s house at 3 Cavendish Place, London. At that time Joseph Clover had taken out a lease on the house and his sister, brother and parents were all living with him there. Clover eventually bought the house and lived there for the remainder of his life. Larkworthy married Elizabeth in 1863 at All Souls Church in Langham Place, a stone’s throw from the house. Later Larkworthy recounted the discomfort he felt at being part of such a high society wedding and his relief at leaving with his bride, even though the carriage was decorated with embarrassing wedding paraphernalia. Elizabeth and Falconer subsequently had six children and he describes her as being a wonderful mother to his little boy from his first marriage. In his memoirs, which he wrote for his children, he speaks in glowing terms of Elizabeth and her brother, Joseph Clover. He was a devout and somewhat Evangelical Christian for his entire life. Falconer Larkworthy spent most of his banking career in London. He returned briefly to New Zealand in 1880 to sell some real estate. The following year he wrote a book about his time in New Zealand which has been digitised and and is available online. It provides many interesting historical insights into life in New Zealand in the nineteenth century. But above all, explains why the London anaesthetist, Joseph Clover, had bank accounts with the Bank of New Zealand.